Focus on Surrey: the B.C. government’s $2.2 billion transit announcement, March 31, 2017. 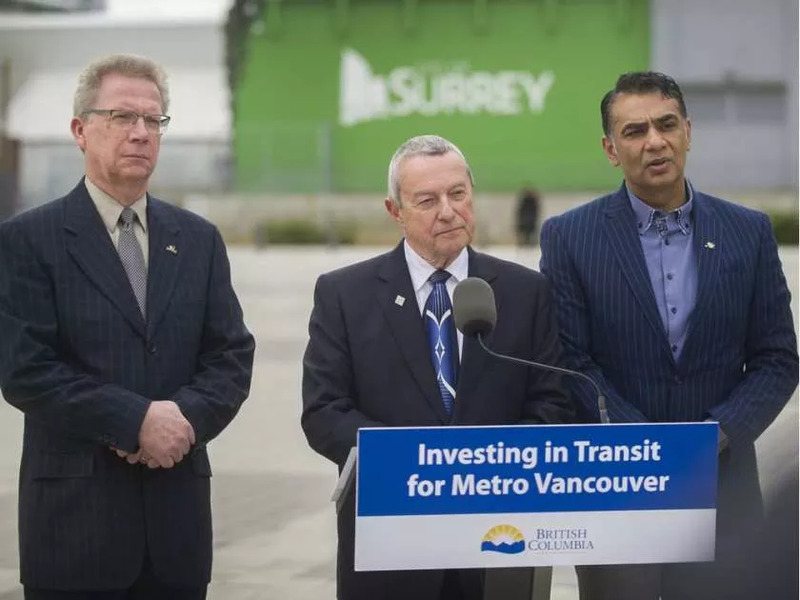 Transit minister Peter Fassbender, MLA for Surrey Fleetwood, is flanked by Marvin Hunt, MLA for Surrey-Panorama, first elected to Surrey City Council in 1988; and by technology minister Amrik Virk, MLA for Surrey-Tynehead, formerly a prominent RCMP officer in Surrey. The photo by Arlen Redekop is clipped from the Vancouver Sun. British Columbia’s Liberal government took a surprising step late last week with a rapid transit announcement that exceeded most expectations. The Province will match the federal government’s $2.2 billion pledge toward Phase 2 of the 10-year transportation plan put forward in 2016 by the Metro Vancouver Mayors Council. This phase includes construction of a Clark Street to Arbutus SkyTrain extension in Vancouver, and the Newton-Guildford light rail line in Surrey. Fassbender and the government had previously suggested they would pay less than Ottawa and impose conditions on the regional transportation authority, but the conditions appear to have been forgotten. The announcement took place in the city of Surrey, and came just six weeks before a scheduled provincial election. It triggered scornful comment on the news chat threads and from the political opposition. Light rail will transform Surrey, but this was overlooked in the media. The Vancouver Sun‘s Vaughn Palmer, perhaps the most astute political journalist in B.C., suggested that the government’s thinking is much more short-term, pointing out that the nine provincial seats in Surrey may decide the election. He speculated that the Liberals’ dramatic turnabout on transit may indicate that they’re running scared. Do the Liberals face defeat, after 16 years in office? Coming up to the 2013 vote, B.C. was awash in polling results that promised a big win for the provincial New Democratic party. The NDP lost, of course, and since then we have seen other and more significant embarrassments for the polling profession with Brexit and then Donald Trump. Most polling firms are shying away from the publication of voter-preference polls in B.C., with the bold exception of Mainstreet Research*, and their numbers offer no clear trend, except for the rise of the Green Party in parts of Vancouver Island. Students of the political occult can check out “Too Close to Call”, which presents elaborate hunches built on available polling information. As we write this, “Too Close” gives the NDP a 61.5 per cent chance of winning B.C., and the Liberals a 38.5 per cent chance. The transit announcement was nearly the last of a long series of funding announcements from the Liberal government — funding for hospitals and highways, seniors’ services and apprentices and much more, in all regions of the province. The common theme through all this was that the government has money to spend, thanks to their management of the public treasury — unlike governments in most other provinces which, for various reasons, are broke. We will see on May 9 whether the Liberals’s many funding decisions will keep them in office. As of today, April 5, the election campaign has officially turned negative. Surrogate organizations on both sides have been running attack ads for several weeks while the political parties stood clear. But from here on, the New Democrats will spend millions to spread the message that the Liberals are “working for there rich donors.” The Liberals will recall the NDP time in government in the 1990s, when thousands of people left B.C. to look for work elsewhere. The provincial transit commitment is a good thing, and I don’t care about the motive. As for predicting the election result, political culture in B.C. is fragmented by region, and increasingly divided by language and culture, and by the countless echo chambers on the internet; whichever party wins, it may be difficult to explain why it happened. *Mainstreet Research is unrelated to Main Street Communications Ltd., which is our consulting firm based in suburban Vancouver. 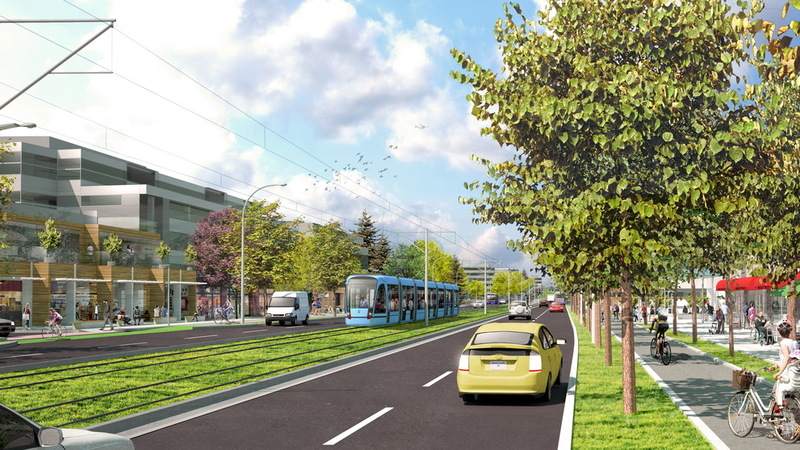 Surrey LRT – the vision. Graphic from the City of Surrey.